I almost always start my canvases or panels the same way ... with an underpainting. It adds mystery and glow even if one can't consciously see it. And I try to leave a bit of that underpainting visible in every painting too, but this doesn't always happen. See the photos below to get an idea of how I work and please contact me with any questions or comments, or tell me how you start a painting. A lot has been going on this late summer and fall. I undertook some personal challenges and there were lots of highs. The first highlight was a family reunion after a many year gap that went extremely well, and then a girls weekend at the coast which was a blast ... high school friends ... so awesome to reconnect after so many years, then I scheduled a painting weekend just for me, and then another painting weekend with my niece who came over from Portland to get inspired to paint again. Phew, I'm tired just thinking about all that fun stuff! One challenge was the painting weekend by myself. A jewelry and painting client talked to me about an abstract for her home in Scottsdale. She kept talking about turquoises and aqua and fuchsias and rusts, yellows and creams. She loves the gem aquamarine and Caribbean blue waters. She then saw a small 7"x5" painting that I have in my jewelry showcase as a backdrop. It was perfect, except she needs a much larger size, 48"x36". I had done that little painting with a squeegee and wasn't sure I could replicate it so large with the same technique. I dug in and started painting it that weekend. Here's a photo and I think I succeeded. To me it looks like a Caribbean hurricane. I'm loving the vortex the fuchsia and yellow create. Her husband saw it and loved it. She has yet to come in as she was away, but it's okay if she doesn't end up purchasing the painting. I learned a lot and undertook the challenge for my own benefit. I really wanted to see if I could do it and I think I did! Special event this First Friday Oct. 2nd ... Beth Hattenberger will be joining us for an evening of Energy Healing. Beth's business is Thriving Body and Soul and she does nutritional counseling as well as energy healing. She'll be sensing for any energy blockages and clearing them, as well as simple balancing. Come in from 5-8pm, meet with Beth one-on-one and see what you'll discover. You'll love her open personality, appreciate her depth of knowledge, and be impressed by her intuitive skills. There is no charge for this brief appointment, and we'll keep a waiting list. Free is good! 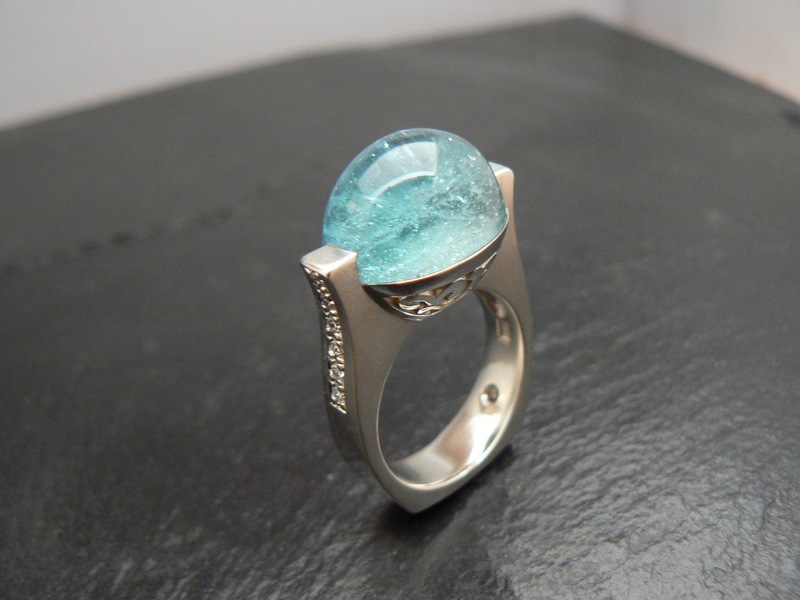 New aquamarine ring with diamonds, open-work and bead-blast texture. I'm open First Fridays from 3 p.m. to 8 p.m. and every Tuesday-Wednesday-Thursday 11:30 - 5:00, and of course by appointment at other times. I'm at 25 NW Minnesota Ave, Suite 5, between Thump Coffee and Alleda Real Estate on Upper Minnesota, Downtown Bend. P.S. : After the last newsletter, kind customers have sent in more testimonials. Thank you so much, I have the best clients whom I'm also lucky to call my friends! Also, my niece has been painting at home. Success! Karen this is the most comfortable ring I have ever owned … I always take my rings off at night (and take most off the minute I get into my house) … two nights I have slept with this ring on!!!! Beauty, excellent design & “craftswomanship” plus comfort … wow! Janice D.
"I put it on yesterday, and enjoyed looking at it all evening. Today I've been busy unpacking, cooking, and gardening (with gloves on). By being busy with it on I'm delighted to see how well it wears with much activity. It is beautiful, but very practical; sits nicely on my finger but doesn't loop around when I'm busy with my hands. A wonderful extra for a lovely design." Denise O.
I have written about finding inspiration before. Sure enough, it almost always comes back to nature's direct influence. At the very least it comes back to being refreshed by nature; rivers, streams, green foliage, and this time really big red rocks! We just returned from a trip to the southwest starting with a quick stopover in Santa Fe and the Georgia O'Keeffe museum. Talk about being influenced by nature, pretty much everything she did was a reflection of nature. I find her work so inspiring and beautiful, even a ram skull was beautiful. When I have been to Santa Fe in the past the museum has been closed so this was a treat for me. Thank you husband Scott for going out of our way, dragging a trailer behind in downtown Santa Fe! Parking was no easy task I might add. The big red rocks were at Arches National Park and along the Colorado River near Moab, Utah. We explored the park and I took lots of photos, and then we drove down a canyon of the Colorado River in search of ancient petroglyphs. Included are a few photos from the trip. It's always nice to come home to beautiful Bend and our dogs. Returning home makes me appreciate the beauty all around us all the more. Speaking of beautiful Bend, it is time for First Friday and salsa dancing in the alley behind my store! Please come join us this First Friday July 3rd for a few new paintings, crisp white wine, and dancing. It should be fun! A pro is leading the dancing so you can talk to him about lessons, too. What are some of your favorite things? Hiking, camping, swimming, gardening or just relaxing in the sun with cocktails on the back deck, BBQ, friends and family? All of the above? For me it is hiking and rivers. I love running water and don't spend nearly enough time in the vicinity of good water. It's an energizing, yet calming thing for me, but also a deep philosophical thing for me, all about movement, paths and journeys. I have been on a personal journey lately, wondering where I am going with my business. I took a very intense step forward and committed to this e-commerce website. It's a step in the right direction emotionally and physically. It is the future. It is a way to reach a larger audience without drastically increasing my inventory or my physical location. It is growth, and renewal, and flow primarily by putting myself out there into the future. (Fresh perspective: "Spring Thaw" 12 x 12 acrylic on canvas). I started painting differently also; I am painting whimsically, boldly yet softly, with energy and excitement popping thru. Fittingly I call this series "Rivers and Paths, and Going Places". A woman visiting here in Bend saw an ad in a local art magazine featuring some rings that I designed (same photo shown in post below), and came down to the shop but I was away at a memorial service, so she called when she got back home. 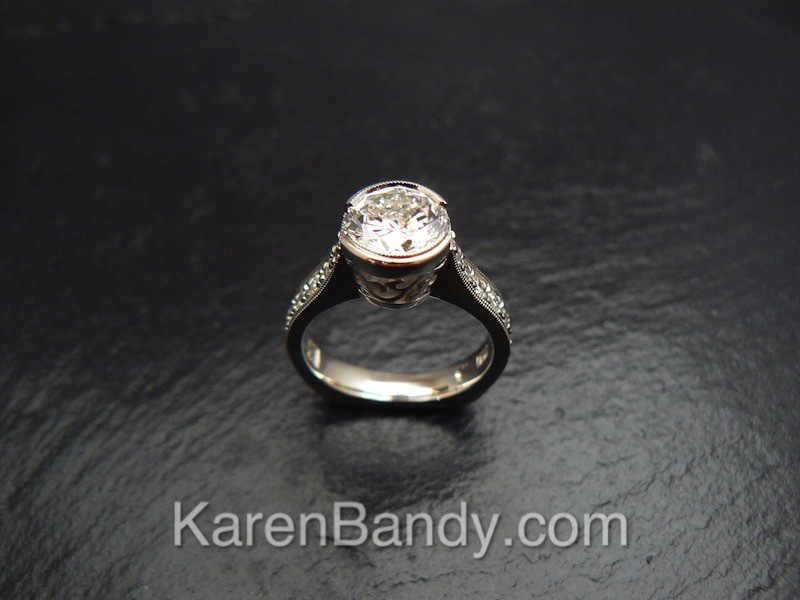 Checking out my website and after a few emails, she chose the rose gold ring with the pear-shape rustic rose-cut diamond, accented with white diamonds. We’re going to custom make some stackers for her to go with the ring. I’m really looking forward to working with her on the stackers. It will be a fun collaboration! She has a good sense of what she wants and the ring I designed serves as the take-off point. taupe, nutmeg and luminous green; each ring sold individually, please check this website, under "rings" for availability. To make these rings unique I combined rustic rose cut diamonds with clear and pristine modern white diamonds, and sometimes black diamonds. One ring features a nutmeg color, rose-cut pear-shape diamond accented with rustic diamond cubes that were mined in the cube shape. I used these intriguing diamond cubes in exactly the same form they had when discovered deep in the ground. Working with the earth and spanning millions of years to create something totally wearable is a wonderful feeling. As you'll see in the photo, for fun I paired some stacking rings with my designs. 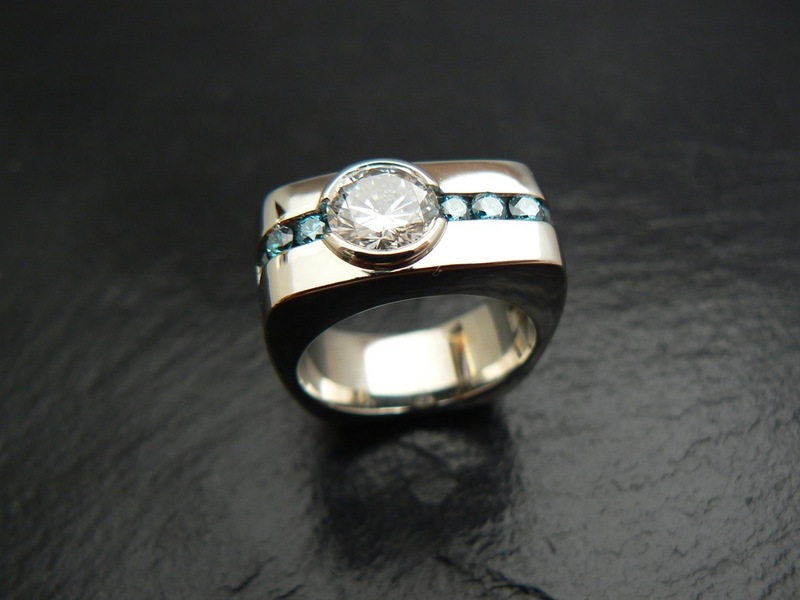 The stackers are quite traditional in style, adding a unique twist to the more rustic diamond pieces. You'll also notice the hammered and shiny surfaces of the white, yellow and rose gold. New in the gallery is the featured colorful abstract painting called "Spring River." When I was 21 years old, a friend and I left college to live and work in Sunriver for the summer. It was such a wonderful time we didn't want to go back to Eugene! I will always remember the times sitting at a cabin on Spring River (just across the Deschutes) feasting on fresh-caught crawdads and drinking Annie Greensprings wine. Times were so simple and relaxed back then. Okay, I'm dating myself, but the memory has stayed clear and vivid in my mind and as I was painting this and it evolved I was struck by how lyrical and flowing it is, much like Spring River. The greens remind me of the grassy lawn, the white the cold spring-fed river, and the orange the setting sun reflected off the water...or maybe the orange is the crawdads themselves! "Spring River," 40" x 30" acrylic on canvas with watercolor crayon accents. I also have some fun new earrings and of course have been busy working with the new gems that I bought in Tucson.